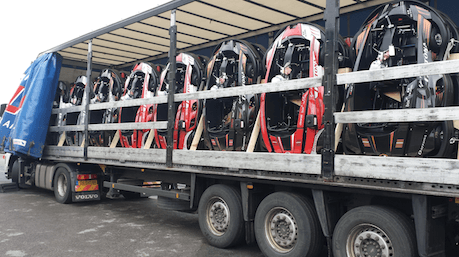 Whilst we are still some weeks away from opening our brand circuit in Tamworth, we were delighted to see yet another lorry from the SodiKart Factory arrive at one of our venues – with 35 brand new Sodi RT8 Karts on board. Daytona Tamworth will offer drivers aged 16 and over the choice of Sodi RT8 390cc Karts or Dmax 125cc Two Stroke Karts. The team at the venue are working hard to prepare the circuit for our opening – we will announce the date here once we know. The Engineering Team at Daytona Tamworth will be prepping and running-in the brand new karts over the next couple of weeks. Elsewhere within the Group, we are expecting our brand new fleet of Dmax Race Karts to arrive this week – although their first outing will be at the second round of our TW Steel Dmax Championships on 14th/15th March. Watch this space for confirmation of Daytona Tamworth′s opening date.